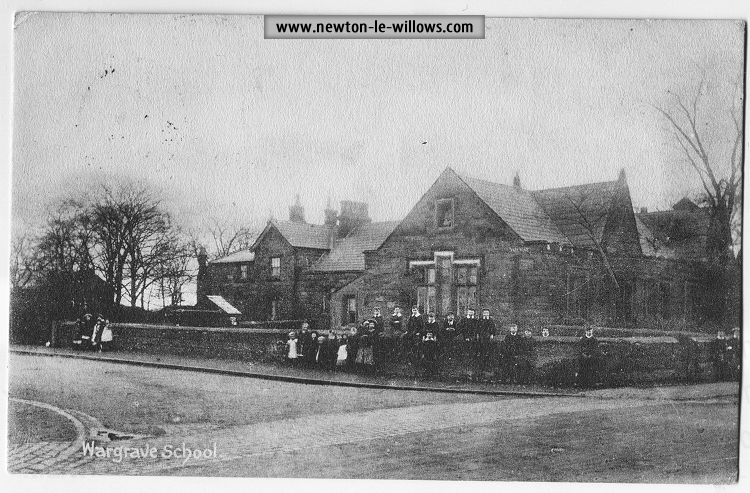 To the Members of the Church of England dwelling at the Earlestown end of the Parish of St. Peter, Newton-in-Makerfield. 1. Divine Service every SUNDAY EVENING at 6-30; and also every THURSDAY EVENING at 8 o’clock, for which Prayer Books and Hymn Books will be supplied. 2. Sunday School every SUNDAY AFTERNOON from 2-30 till 3-3o, which Boys and Girls between the ages of 4 and 14 may join. 3. A Mothers’ Meeting every THURSDAY AFTERNOON from 3 till 4, to which all Mothers are invited to come and bring their work. We would especially urge those of you who have the fewest opportunities, the poorest, the hardest working among you, not to neglect these which are now offered to you. Make an effort to come, though, on Week-days, it be as you leave your work, in your working clothes; and, by God’s blessing, you shall not be sent empty away. A concert was given one week-evening before commencing the services, at which Mr. Peter Fairclough was conductor, and at which we were present and had the privilege of contributing to the funds. The assistant curate lived at the Mill residence. The mission was continued for a few years, and then for lack of support or for some forgotten reason was discontinued. In 1898 the Rev. H. Monk died, and the Rev. James Ryder was appointed to the living. He commenced Sunday services in the Gas-street School, Wednesday evening services during the Advent and Lenten seasons, and a Men’s Bible Class on Sunday afternoons, the latter addressed by himself and the Rev. A. E. Bass alternately with the Bible Class at St. Peter’s, and occasionally by Mr. W. Pierpoint. The services were held in the principal room of the school and were well attended, chairs and desks being so arranged to accommodate the congregation comfortably. A small table with handsome covering (the gift of Newton friends), which was used for the holy table, a prayer-desk, also used as the pulpit, and an harmonium comprised the fittings of the mission-room. Mr. P. Fairclough was organist and choirmaster for a time, and was followed by Mr. A. Clough ; Messrs. J. Markland and R. Thompson (sides-men) seeing to the comfort of the worshippers. A mothers’ meeting was held, which was addressed by the clergy and sup-ported by Mrs. W. Collingwood, Mrs. A. Smith, Mrs. Overton, Miss E. E. Watkins, and Miss B. M. Watkins. 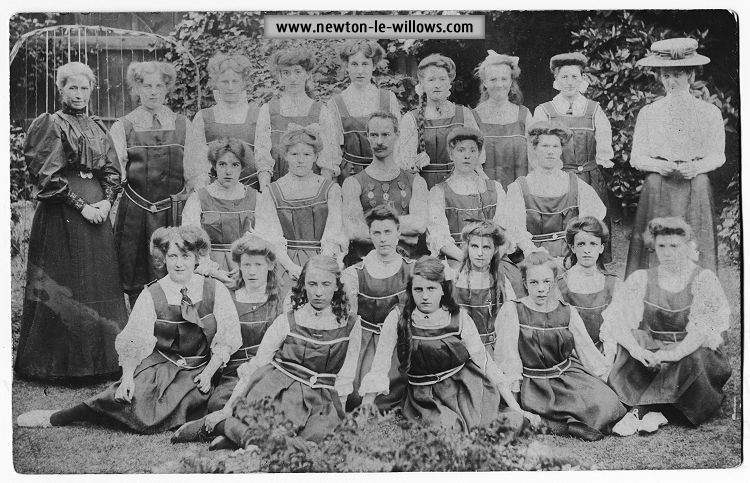 A small choir of girls met together to practise the hymns and chants, and led the singing at the services in a very creditable manner, on one occasion, with a little outside help, giving a service of song, entitled "Emmanuel," Mrs. Collingwood being the reader. This was repeated later with Mr. Pierpoint as reader. The Rev. A. E. Bass came to the parish in 1905, and stayed here until February, 1908. During his stay the mission greatly increased, the Vicar allowing Mr. Bass a free hand in the administration of this part of the parish, and often assisting him himself. The Rev. T. B. Walcot succeeded the Rev. A. E. Bass as curate of St. Peter’s in 1908, and unfortunately died on the 3rd November of that year, having laboured here a little over four months, but during this short period had become endeared to the people of the mission. On the death of the Rev. T. B. Walcot, and pending the appointment of another curate, Mr. W. Pierpoint, who had previously officiated, was appointed to take the mission services. Mr. W. Pierpoint, with the Vicar, also held open-air services in Hotel and Houghton streets, and made a practice of regularly visiting the sick in the neighbourhood, thus gaining many friends and administering help and consolation to the distressed. 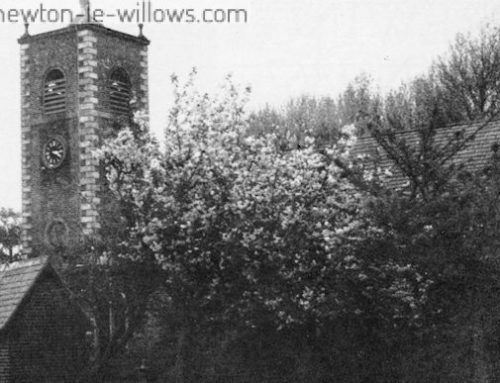 In April, 1910, Mr. W. Pierpoint was nominated by the Vicar for the Bishop’s licence as lay reader, which he received from his lord-ship’s hands, on the 26th April of that year, in St. Andrew’s Church, Aigburth, the licence stating that the recipient was fully competent to carry out the duties entrusted to him. Mr. Pierpoint continued at the mission nearly three years, and during his time Captain McCartney, of the Church Army, with his Liverpool Van, was able for some two or three months to deepen the spiritual work previously accomplished. In 1910 the Rev. 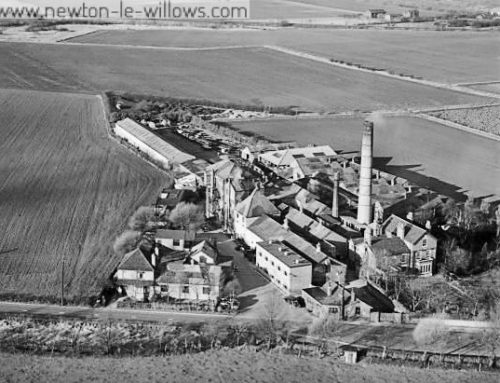 F. F. Komlosy was appointed assistant-curate, and on entering on his work found the services so well attended that he sought for expansion in a larger room, and eventually, with the sanction and approval of the Vicar, Mr. Holt’s assembly-room, near the Wargrave railway bridge, was taken. In this room morning and evening services were held, and the Sunday-school was removed to it from Gas-street. Soon after Mr. Komlosy’s arrival, Mr. Collingwood made a munificent gift of £1,000 towards the erection of a permanent church. Mr. Komlosy continued the good work here until the appointment of the Rev. B. E. Taylor. the Rev. B. E. Taylor succeeded the Rev. F. F. Komlosy at the Mission in 1911, and shortly after his appointment a movement was made towards providing a church at the Earlestown end of St. Peter’s Parish, in the calling of a meeting in St. Peter’s Central Schools, on the evening of the 17th October, 1911, to pledge support to the building of a church, to be named " All Saints," on a site, given by Lord Newton, near the Technical School. There was an enthusiastic gathering, the Lord Bishop of Liverpool (Dr. Chavasse) being chairman, who was supported by the Venerable Archdeacon Spooner, Canon F. W. Willis (Rural Dean), and the Rev. James Ryder (Vicar of the Parish). Others present included the Rev. B. E. Taylor (secretary of the scheme), the Rev. Webster Hall, the Rev. A. White, the Rev. T. W. Owen, Colonel J. L. Wood, W. Collingwood, Esq., J.P., Mr. Segar Owen, Dr. H. E. Watkins, Mr. E. Leyland, Mr. W. Speakman, members of the building committee, and the following ladies: Mrs. B. E. Taylor, Mrs. W. Collingwood, Miss Pennington, and Mrs. Overton. He did not know why, but throughout the day a sentence from Sir Walter Scott’s romance, "Guy Mannering," had been running in his mind as he thought of the meeting that night. One of the leading figures in the romance cried, "The hour is come, and the man!" He thought the hour for building the new church in Newton had come, and the man who, by God’s help, was to guide them in building it had come also. He did not disguise the fact that for many years that corner of the diocese had been the occasion of very great anxiety to him. 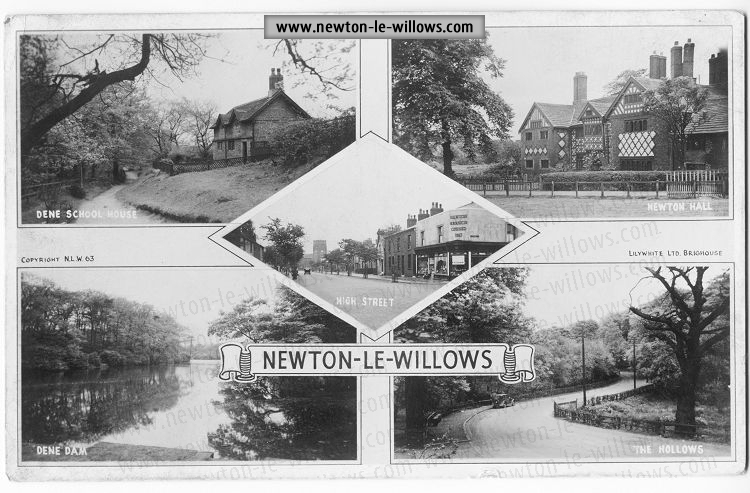 Here was Earlestown with its 13,000 people and two clergymen, and adjoining it was Newton-le-Willows with 5,500 people more and only one clergyman. 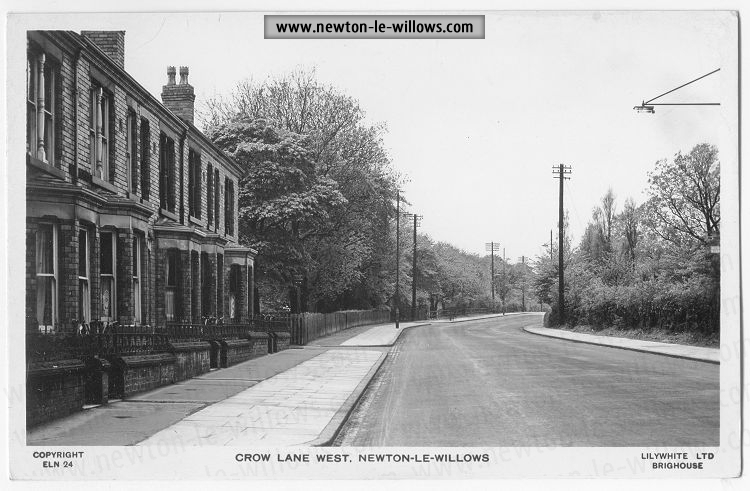 How to help Earlestown and Newton he could not at the time see, and when he was in the deepest perplexity it was the laity of the neighbourhood who came to his rescue and saved the situation and solved the difficulty. He could never feel sufficiently grateful to Mr. Collingwood, to Colonel Wood, Mr. Arthur Smith, and others for the part they took at that critical moment. It was they who guaranteed the stipend of a curate; and they knew that Mr. Walcot came amongst them briefly to run his course and die before he had worked here more than a few months, but doing more by his early and lamented death than ever he did in his life. He could not help connecting in his mind this movement to build a new church with the early death of that young clergyman of the Church. Out of, so to speak, the seed of his death had given this Church movement into life. Then, after a long time of waiting, Mr. Komlosy came amongst them; and then again, after a time, the laymen came to the front and Mr. Collingwood sent him that generous gift of a cheque for £1,000 towards the new church, bringing it within the scope of practical politics. These same laymen offered guarantee again for the greater part of the stipend of a second curate, and the way was made open. The hour had come, the curate’s stipend was provided, and a great step began towards raising funds for the new church. And then with the hour came the man. It was six years ago when he first had the pleasure of meeting Mr. Taylor. 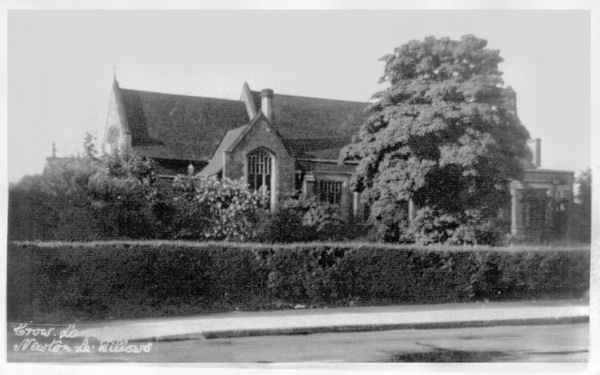 He was at that time a master at the Merchant Taylor’s School at Crosby. He had had a distinguished University career at Oxford. He was a Scholar of Queen’s, supporting himself mainly by scholarships and exhibitions won in the open field through his ability. He took a distinguished degree, the same degree exactly that the Bishop of London, who had been speaking lately in Liverpool, took many years before him. He took first class in Classical Moderations, and second class in the final Classical Schools, a very distinguished degree. 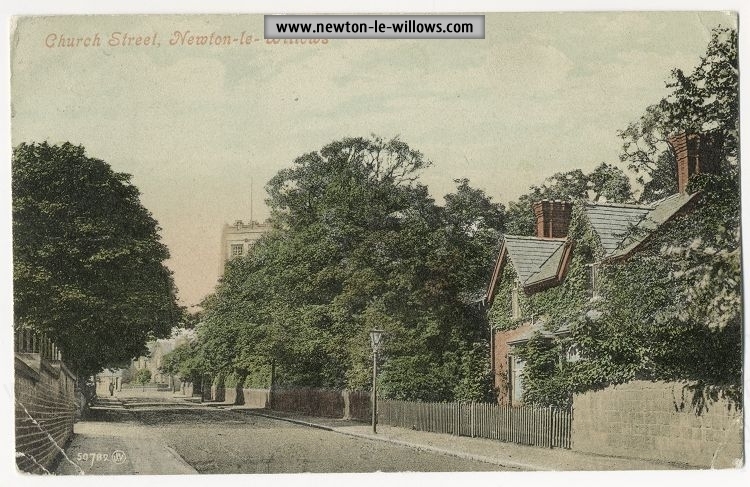 Very soon after he got to know Mr. Taylor, he came and offered himself for ordination and parish work, and he was ordained as a curate to Woolton, the parish in which Archdeacon Spooner laboured so long and with such great success. There Mr. Taylor was trained by one of the ablest of the younger clergy, and he won the hearts of the people of Woolton, and the respect and highest regard of the well-to-do people. The people of Woolton would never forget how he filled the mission church. 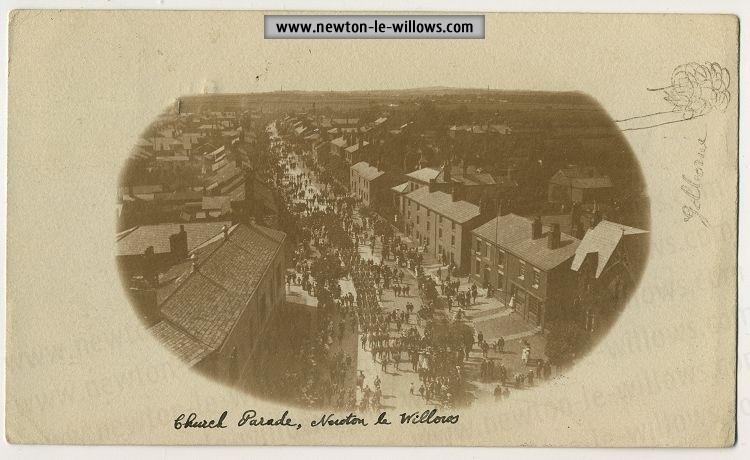 During the Woolton Mission, held not long ago, it was a wonderful sight to see, night after night, the quarrymen going down in procession to the parish churchmen who had perhaps never been in church before. A great measure of the success was due to Mr. Taylor. 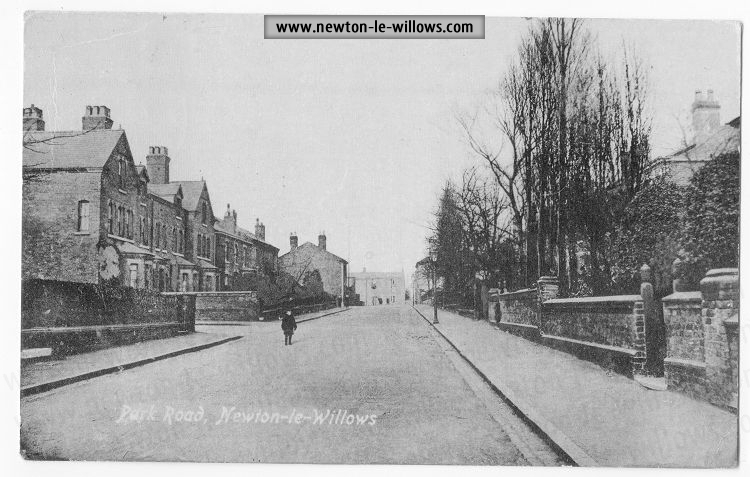 When he was asked to come to Newton, he readily consented, and now he had come, not alone, but he had brought with him one of the best workers in Woolton as his wife to assist him in the work, and here were two amongst the best of the workers in the diocese ready to dedicate themselves and their lives to this work of building a new church and gathering a congregation in Newton-le-Willows. ..Earlestown Guardian. The building scheme being now successfully launched by the gift of £1,000 from Mr. Collingwood and the gift of the site (valued at £600) by Lord Newton, Messrs. W. and S. Owen, of Warrington, were selected as architects, and the tender of Messrs. George Finning and Sons, of Earlestown, was accepted for the first part of the fabric, including chancel, vestries, and three bays of the nave, amounting to £3,325. 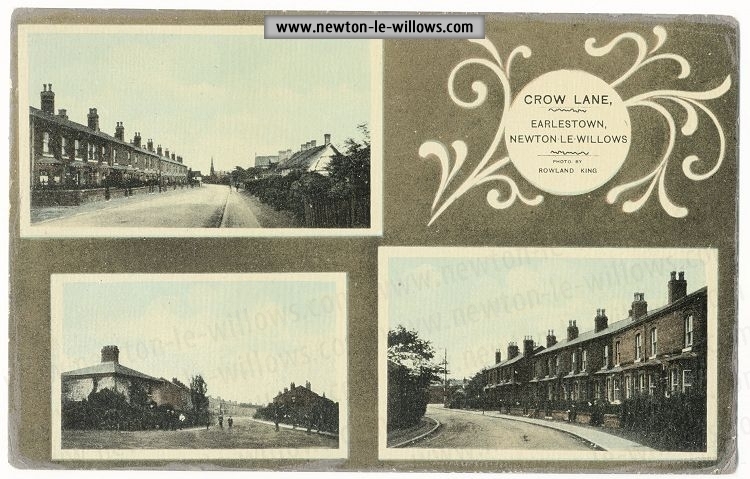 THE DATE OF THE VISIT OF KING GEORGE V. TO EARLESTOWN. The Provincial Grand Treasurer deposited the phial containing the coins, and the Provincial Grand Secretary placed the plate on the lower stone. The cement was then spread on the upper face of the lower stone, and the Provincial Grand Master adjusted the same with the trowel handed to him by the architect, after which the upper stone was slowly lowered. The Provincial Grand Master then proved the just position and form of the stone by the plumb-rule, level, and square, and gave the stone three knocks with the mallet. The cornucopia containing the corn and the ewers with the wine and oil were next handed to the Provincial Grand Master, who strewed the corn and poured the wine and oil with the usual ceremony. At the close of the ceremony, the Hon. 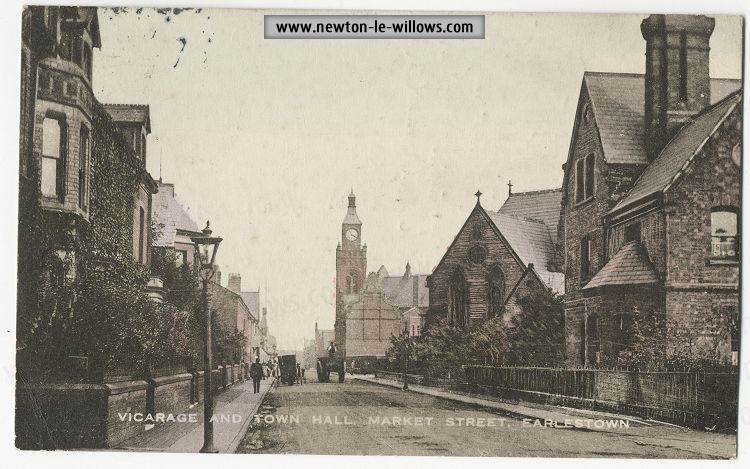 Arthur Stanley said he had informed the King of the fact that the foundation-stone was to be laid on the day His Majesty visited Earlestown, as a witness to the time when Their Majesties visited their loyal subjects. His Majesty graciously authorised him to express his pleasure at knowing that their visit to them was so fittingly commemorated. When the history of that building carne to he written they would find it was founded on self-sacrifice and finished through loyalty. That day, in the presence of them all, with that striking Masonic rite which many of them had never seen before, that foundation-stone had been laid by one who was a member of a noble house, revered far and wide in Lancashire, and by one who was the representative of a constituency in this neighbourhood, and who was, he thought he might say, as much honoured by his political opponents as he was by those who supported him. The church would meet a great need to-day, but it would meet a far greater need in a very few years’ time. They all thanked their gracious King and Queen for the message they had sent. 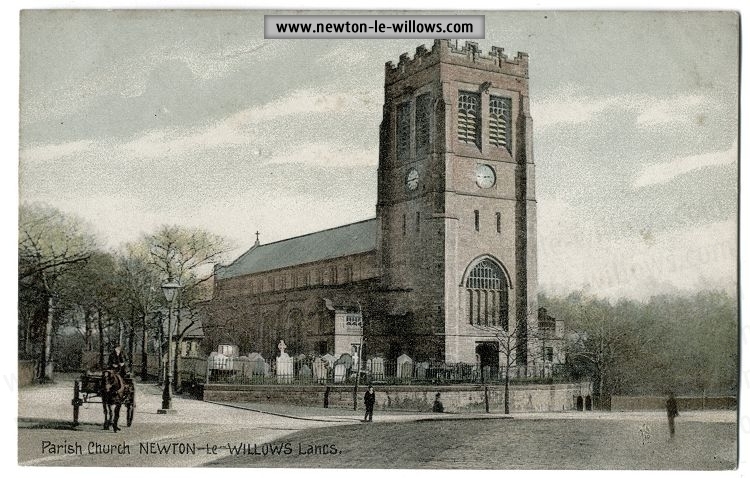 This church would ever be linked with the memorable day on which Their Majesties visited Earlestown and Newton-le-Willows. They would bring their children, and their children would bring theirs to this church, and they would say they remembered the day on which the foundation-stone of this building was laid, for the King and Queen came on that day. He was perfectly sure of this one thing, that they would never allow this debt of £1,200 to rest upon a building which their King and Queen had blessed, but as loyal citizens of a great empire, out of regard for their King and Queen, would do their very best to see that the foundation-stone laid in the presence of such a vast concourse of loyal Lancashire people would be the foundation of a church upon which not a single iota of debt rested when in a few months it was dedicated t6 the service of Almighty God.—Earlestown Guardian. On Friday and Saturday, October 17th and 18th, 1913, a sale of work in aid of the building fund was held, the opening ceremony on the first day being performed by Viscount Wolmer, M.P. 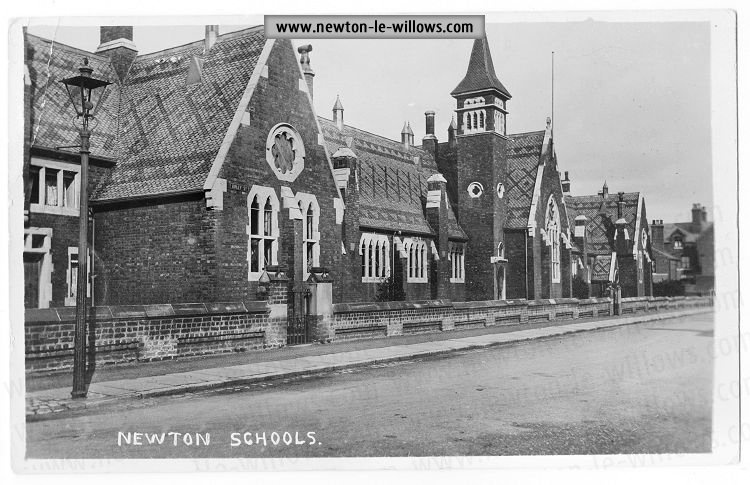 for Newton, and that on the second day by Colonel L. E. Pilkington. The results of the sale were as follow: First day, £54 17s; second day, £53 8s. 10d, realising, with the second day’s proceeds being doubled by a generous friend, a total of £161 14s. 8d. about £620 was thus still required for building the first portion of the church. In January, 1914, it was decided to complete the church exclusive of the tower. On the 31st October, 1914, the church was completed, and was dedicated by the Lord Bishop of Liverpool before a large congregation. The clergy robed in the adjoining Technical School and walked in procession to the church, the choir chanting Psalm xxiv. as they moved down the centre aisle. The clergy present were the Bishop, the Rev. James Ryder (Vicar of the Parish), the Rev. B. E. Taylor (Curate-in-charge), the Rev. O. E. Hill (Curate of St. John’s, Earlestown), the Rev. B. H. Watts (Curate-in-charge of St. Philip’s, Newton Common), the Rev. 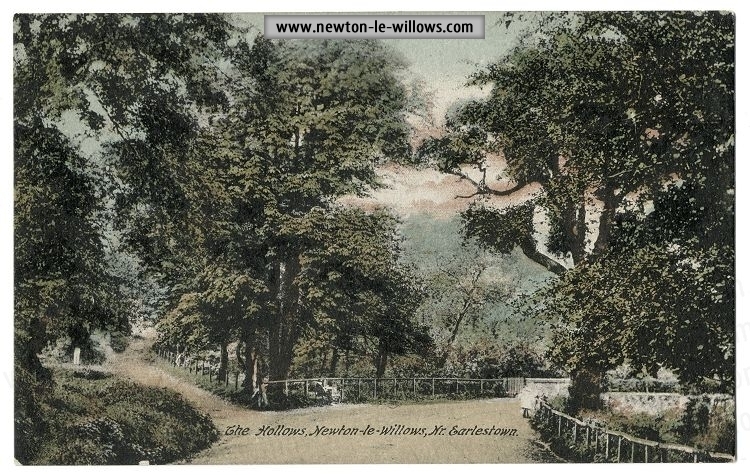 W. Williams (Rector of Ashton-in-Makerfield I, the Rev. W. Pollock Hill (Vicar of St. Thomas’s, Ashton-in-Makerfield), the Rev. A. White (Curate of St. Peter’s Mission Church, Bryn), the Rev. E. W. A Whittenbury Kaye (Rector of Newchurch), the Rev. P. W. Phehsey (Secretary of the Diocesan Temperance Society), the Rev. A. E. Buer (Curate-in-charge of St. Paul’s, Goose Green), the Rev. J. H. Jordan (Vicar of St. Mark’s, Haydock), the Rev. Canon F. W. Willis (Rural Dean), the Rev. H. Marriott (the Bishop’s Chaplain), and the Lay Readers (Mr. W. Pierpoint and Mr. G. Collinge). The service was very impressive and the singing of the choir excellent. Their thoughts went back that day to the beautiful and bright afternoons in Jul, when with the visit of the King and Queen, the foundation-stone of that church was laid with stately Masonic ceremonial and With beautiful prayer, before a very large multitude. What a vast difference that day was from this, they then lived in times of peace, No thought of war crossed the minds of any of them. Their King was close at hand and their Queen had graced them with her presence, England seemed happy and secure and thought of bloodshed was far from them. Today they opened that church ins troublous times- the most troublous times they had ever seen. Today they were battling for their very existence. As a first-rate power they were fighting for the liberties of the smaller states of Europe, and also for their own: for the peace of the world and for their hearths and homes, He did not believe- he was under any mistake in saying that the fierce battle that was raging at the present time on the frontier of Belgium was a battle for their Hearths and homes. If the German army hacked its way to the coast and gained possession of it, it would not be long before, in some form or other, the thunder of guns and the tramp of the foe would be heard on these peaceful shores of England.	.
And so it was in these troublous days they thanked God fur the opening of that church, which would send forth light and the truth of God over that neighbourhood, and make it a place where hungry souls would be fed, sorrowful hearts comforted, and the weak made strong. For just as the darkness of night brought out those heavenly bodies which they could not see in the glare of day, so the darkness of the troublous times brought out the truths which in the bright days of prosperity were apt to be forgotten. . .. He thanked God from the bottom of his heart that at such a time as this, when God was revealing Him-self to them, that Church of All Saints had been opened, and he prayed to God that within its walls the sacrament of the faith might be celebrated with reverence, with reality, and with frequency, that souls might he fed with the bread of life, and he prayed that Jesus Christ might be so lifted up that the penitent might find peace and the weary strength, and men and women might go forth from that church witnesses for God through the strength that God had given them within those walls. They called it the Church of All Saints and they dedicated it on the eve of the great festival when they thanked God for the dear ones who had passed away and who were standing in Paradise waiting for them. — Earlestown Guardian. The offertory, in aid of the building fund, realised £57. The festival was continued on Sunday in the presence of large congregations, and the collections throughout the day totalled £1,020, which included a cheque for £1,000. A sum of £400 still remained to be collected. Services were also held every evening during the week, the collections at which, together with the proceeds of the Sale of Work on November 6th, 1915, and subscriptions received in the interim, leave a total indebtedness of £300. The general style of the building is Late Perpendicular, and in plan the church consists of a wide nave, two side aisles, a chancel, and a vestry for the clergy and choir. The vestry is on the north side of the chancel, and the building is so arranged that a chapel can be added on the south side of the chancel should future requirements necessitate this enlargement. From the east wall to the west wall the building measures 105 feet 6 inches, the width of nave between piers being 22 feet, and the chancel 19 feet. The church is built of rustic bricks with stone dressings to windows, plinths, parapets, and gable coping, the west gable finishing with a single-bell turret. The entrance is by a porch in a central position below the west gable window. The interior is carried out with stonework dressings and plastered faces, which latter will be decorated with stencil designs. On either side the nave opens with five arches into the aisles, and the chancel has a single arch in which the organ case will be placed. The east and west windows are each five-light with richly-carved and cusped heads. In the less prominent walls there are three-light windows with the upper portion again divided into six ; also two in the south wall of the chancel. In the vestry northern wall there is a large three-light window with the upper portion again divided into eight. Both the chancel and the nave roofs are open timbered, the principals being designed in heavy timbers as arches rising from the piers and apex of the nave arcade. 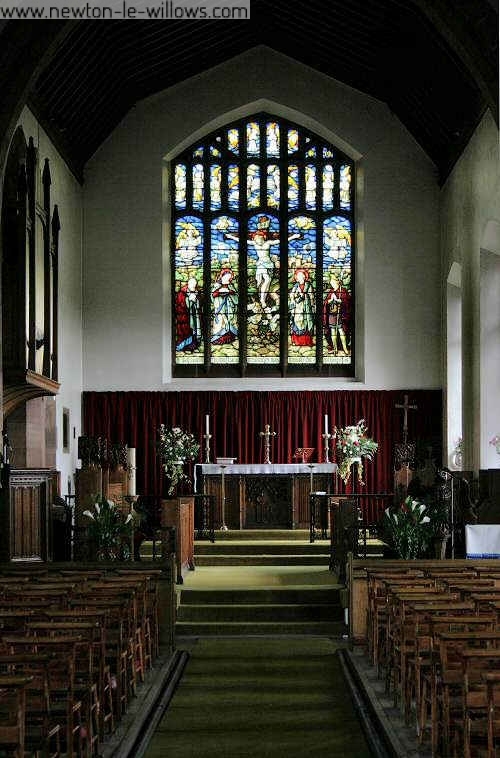 The church is seated with chairs, providing accommodation, with 24 seats in the choir stalls, for 500 worshippers. The chairs are slightly raised above the aisle floors, the whole floor-space being laid with maple-wood blocks. The furniture consists of a beautiful carved-oak Communion table, a neat wooden pulpit, a carved eagle lectern, a litany-stool, a new Sicilian marble font, and an harmonium. The large clear-glass windows give ample light by day, and the conveniently-placed gas-pendants with incandescent mantles give the requisite light for the evening services. The building is set back well from the road, leaving ample space of ground for its display, and is enclosed by iron railings. The ground has been set with trees and shrubs, and walks have been made to the entrance and to the vestry. It is to he hoped no other buildings will be placed on this plot. As the locality becomes more populous, and the proposed street on the south of the church is made, it is also to be hoped that the proportions of the street will be such as to set off the edifice. If we might venture to suggest a future policy, and something to be kept in view by those in charge of the church, it would be for a vicarage and church-house to be placed south of the church and across the intended street. 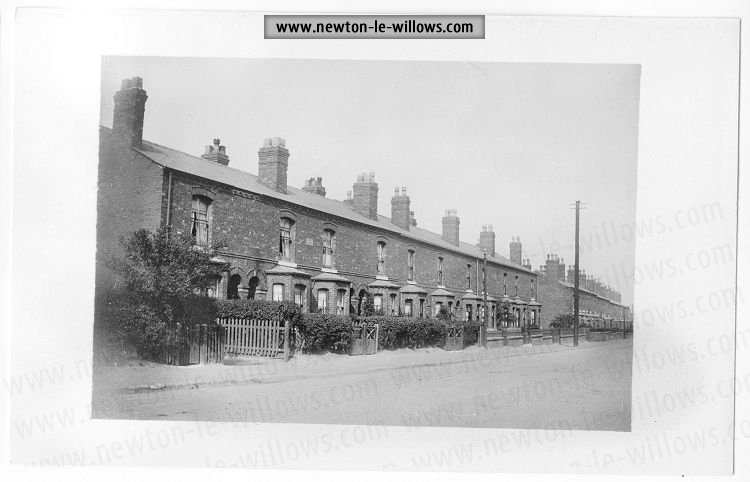 These buildings would stand on the rise of the ground before the field dips to the south in the Earlestown direction. We believe that if this could be accomplished, the community would have a nucleus of buildings, each setting off the other and in the very centre of the parish work. The architects of the church are Messrs. W. and S. Owen, of Cairo Street, Warrington, whose designs were selected from many sent in, and the builders are Messrs. George Finning and Sons, of Earlestown, to both of which establishments we are pleased to state the church does great credit. The Holy Table was given by Messrs. W. and S. Owen, the architects of the church, in memory of Mr. W. Owen. The Communion Vessels were presented by Mr. F. J. Wood and his son and daughter in memory of the late Mrs. F.J. Wood. The Fair Linen Cloth was the gift of the Mothers’ Meeting and friends per Miss E. E. Watkins. The Candlesticks were presented by Mr. N. McCorquodale. The Alms-dish was given by Woolton Parish Church. The Small Alms-dishes were given by Messrs. G. Farrell, W. R. Halson, R. Pilkington, and W. Sellars. The Flower Vases for the Holy Table were the gift of Mr. and Mrs. George Goff. The Pyx for Bread for Holy Communion was given by Mrs. Willis, of New Zealand. The Book-rest for the Holy Table was presented by the Women’s Bible Class. The Sanctuary Kneeling-desk was given by Mr. and Mrs. G. Collinge. One Sanctuary Chair was given by the late Mr. James Liptrott, the other anonymously. The Carved Eagle Lectern, the gift of the Birley family to St. Peter’s Church, was transferred to this church. The Lectern Bible, in memory of Mrs. Mayor, was given by her husband and family. The Credence Table was the gift of the Men’s Bible Class. The Litany-desk was presented by the Rev. B. E. and Mrs. Taylor in memory of Miss Wainwright. The Red Book-markers and Pulpit Antependium were the gift of the Rev. E. C. Poulter. 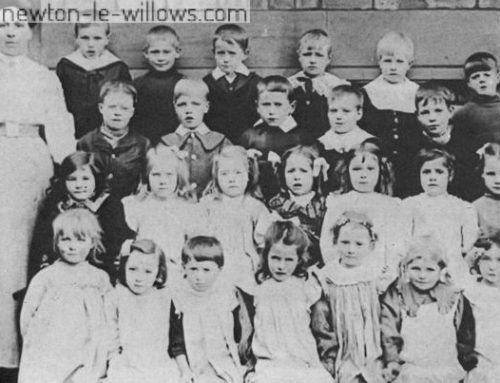 The Festal Book-markers were given by Miss E. Mather (Woolton). The Font and Ewer were provided by money collected by the Sunday-school children. The Kneelers for the use of Godparents at the Font were the gift of Mrs. Mitchell. The Mats and Kneelers were given by Mrs. W. Collingwood. The Umbrella-stand was given by Mr. F. Wagg. The Hymn Board and Cards were given by Mr. and Mrs. H. Ball. The Bell was provided by money collected by the Sunday-school children. 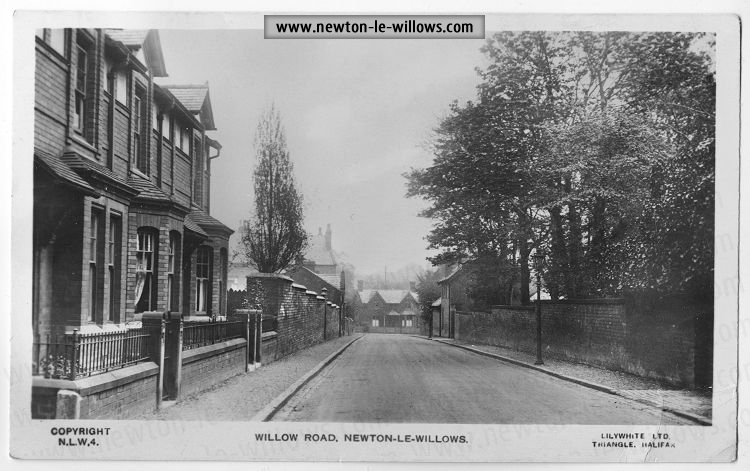 The Iron Railings surrounding the Church and site were provided by Mr, W. Collingwood. Rev. J. Ryder (Vicar of the Parish), Rev. B. E. Taylor (Curate-in-charge of All Saints’). Mr. W. Pierpoint, Mr. G. Collinge. Mr. F. Wagg, Mr. W. Collingwood. Messrs. G. Farrell, G. Goff, W. R. Halson, S. Kirkham, J. Markland, R. Pilkington, W. Sellars, and R. Thompson. Mr. J. Clough, deputy. Church Building Fund, Mr. Collingwood. Mothers’ Union, Miss E. E. Watkins; Girls’ Club, Miss Siddeley; Children’s Guild, Mrs. Halson; Sunday-school, Mr. Sharpe; Magazine Advertisements, Mr. C. D. Mayor; Freewill Offering Fund, Mr. F. Wagg; Communicants Guild, Miss Parker; Choir, Mr. C. D. Mayor; Missionary Boxes, Miss Sharples. Teacher of Youths’ Bible Class, Mr. T. Wood. Mesdames Clark, Clough, Farrell, Green, Mitchell, Pierpoint, Southern, and Taylor; Misses Blackwell, Brierley, and Siddeley. 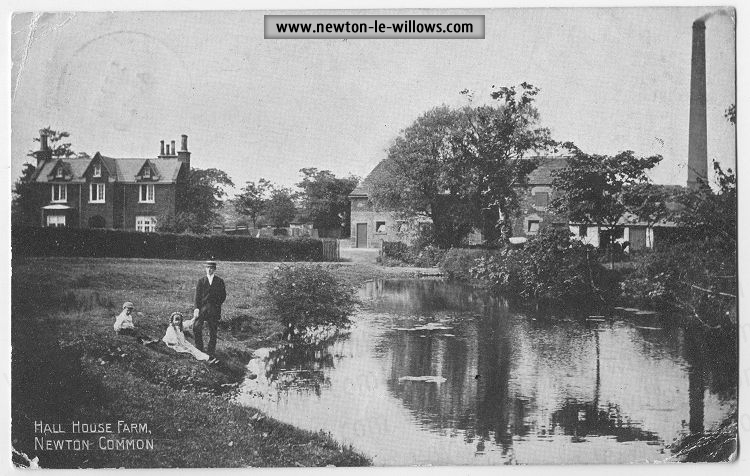 1911.—Taylor, Bertham Eustace, 89, Cross Lane, Newton-le-Willows.—Hastings Exhib. and Hon. Scho., Queen’s College, Oxford. 1st cl. Mods. 1900. 2nd Lit. Hum. 1902. B.A. 1902, M.A. 1908. Deacon 1906, Priest 1907 by Bp. of Liverpool. 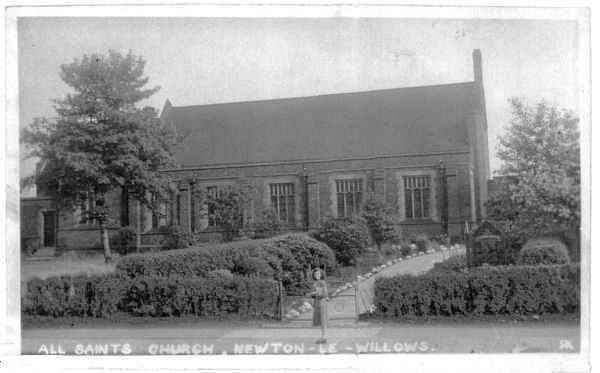 Curate-in-charge All Saints’, Newton-le-Willows, 1913. Formerly C. of St. Peter’s, Voolton, 1906-11 ; Asst. Dio. Insp. of Educ. 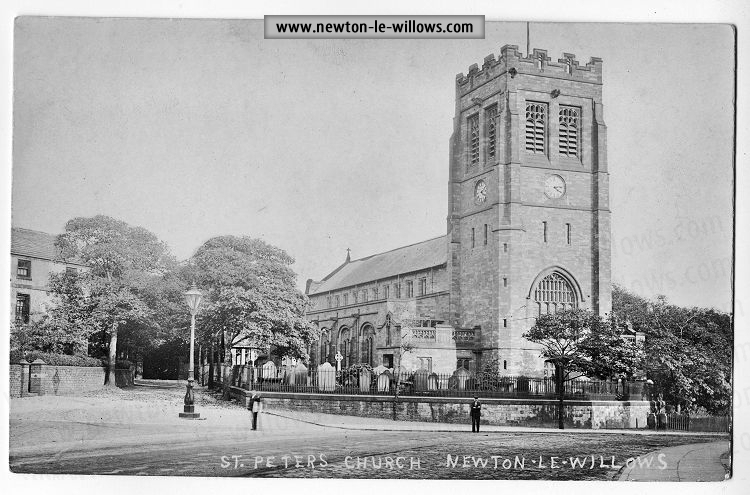 1912 ; St. Peter’s, Newton-le-Willows, in charge of Mission District, 1911-13.—Liverpool Diocesan Calendar, 1915. On Sunday evening, November 7th, 1915, we played truant from St. Peter’s Church, and went to attend service at All Saints’, which we had not attended since the opening-day on October 3rst, 1914. Arriving early, we took our seat in the northern aisle, and by the time the ringing of the bell had ceased a goodly number of worshippers had arrived, amongst whom was a fair proportion of men. The service began with a prayer, by the Rev. B. E. Taylor, for the members of the choir assembled in the vestry at the north of the chancel, after which they immediately proceeded to the choir stalls, the congregation standing the while. The thanksgiving hymn, 379 A. and M., " Now thank we all our God," was sung with heartiness by the choir and congregation. This was followed by one of the sentences of Scripture, the Exhortation, the Confession, and the Absolution, read and pronounced by the Rev. B. E. Taylor in a clear, resonant voice that could be heard distinctly, even to the consonantal endings of the words, in every part of the church. The Lord’s Prayer and the versicles were intoned, and then followed Psalm xxxvii. chanted to the pointing of the " Cathedral Psalter," and accompanied by the organ played by the blind organist, Mr. Alex. Clough. The first lesson was read by Mr. Taylor (father of the Curate-in-charge) in a reverent manner and not too loud voice, and the second lesson by Mr. W. Pierpoint, the lay reader, in a clear voice and with feeling. The Magnificat and Nunc Dimittis were reverently sung to chants and pointing familiar to frequenters of St. Peter’s, the Apostles’ Creed was intoned, and the versicles, the Lord’s Prayer, and the three Collects were reverently read by the minister and responded to by the congregation. Then followed hymn 176, " How sweet the Name of Jesus sounds." The Special Prayers appointed to be said during the War were now offered instead of part of the second portion of the Evening Service, and, preceding the offering of the prayer for the soldiers engaged in the War, the clergyman read the All Saints’ Church Roll of Honour, containing many names with which we are familiar. 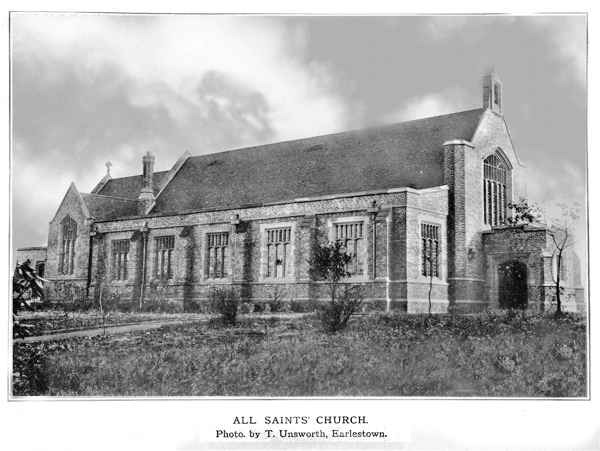 After this the announcements for the week were made, and the result of the previous day’s Sale of Work, in the Earlestown Town Hall, was announced—12o being realised—for which the minister, on behalf of himself and the congregation, gave thanks to God and to those who had so earnestly and so selfsacrificingly worked. Hymn 261, "Blessed are the pure in heart," followed, and then began the sermon from the text, " Delight thou in the Lord, and he shall give thee thy heart’s desire " (Psalm xxxvii. q). And, as is his wont, the preacher (the Rev. 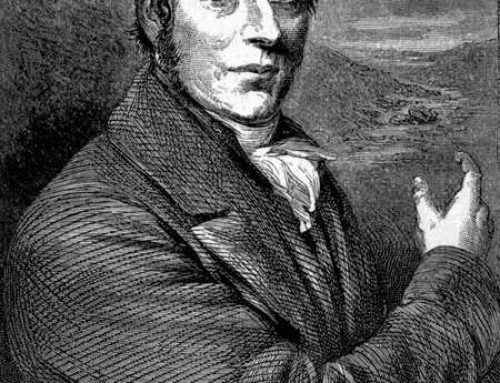 B. E. Taylor) did not deviate from his text, and gave good reason for thankfulness to God for His many mercies, and drew a beautiful analogy of one’s delight in the Lord from the holy love or delight of a lover for his dear one, illustrating it by a quotation from Byron’s poem on "The castled crag of Drachenfels" and one from Charlotte Elliott’s hymn, " Thy will be done." After the sermon, and during the collection, hymn 27, " Abide with me," was sung. Then the Benediction was pronounced, followed by the congregation singing the first two verses of the National Anthem kneeling, and the Doxology standing. The choir then left the stalls, and the congregation remained standing until the prayer for the choir was finished and the service ended. Everything had been done " decently and in order," and in a reverent spirit, and the minister, lay readers, organist, choir, church officers, church workers, and congregation are to be commended for the efficiency they have attained in so short a period. 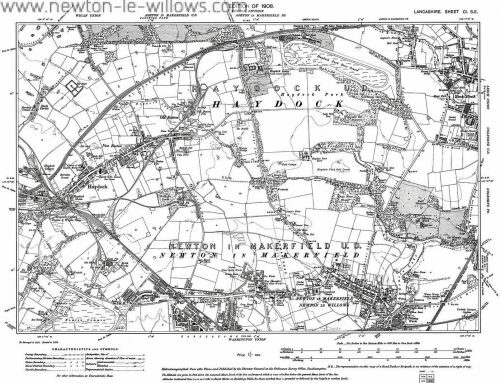 This text is transcribed by Steven Dowd ©2007 from original source, for use in the newton-le-wilows.com website..